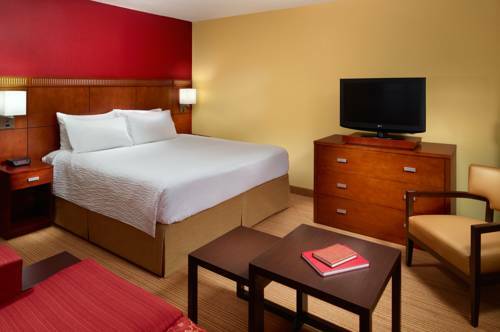 Comfort and convenience unite for a pleasurable stay at Courtyard Atlanta Cumberland/Galleria. Situated in the heart of Cumberland, GA, a scenic neighborhood just 10 minutes from Downtown Atlanta, our hotel offers easy access to Cobb Galleria Centre and Six Flags Over Georgia. Whether staying busy with work or play, end your day in our modern guest rooms and suites, featuring complimentary Wi-Fi, ergonomic workstations, luxurious bedding and plenty of space to spread out. Head over to The Bistro - Eat. Drink. Connect. for breakfast and a Starbucks beverage in the morning, then return in the evening for a variety of fresh sandwiches and salads paired with your favorite cocktail, beer or wine. Active travelers wishing to maintain their workout routines can break a sweat in our state-of-the-art fitness center, followed by a refreshing dip in our indoor pool. When it's time to get back to work, bring business to life in one of our four meeting rooms with high-tech amenities and catering services.